Whole wheat pizza dough can give your pizza a healthier edge without sacrificing flavor. 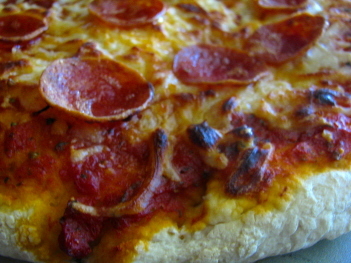 Here is an awesome healthy pizza crust recipe. If you're looking for a whole wheat crust to make your pizza a little healthier, look no further! Use this crust with your usual toppings and enjoy a hearty and healthier pizza. This recipe is basically the same as this easy pizza dough recipe, but instead of using all-purpose or bread flour, you'll use whole wheat flour. Place very warm water (you might start with hot water), yeast and sugar in a Kitchen Aid-type mixer or food processor. Use the bread hook if you have a Kitchen Aid mixer. Mix for a couple of seconds. Let it sit for a couple of minutes. The yeast and water mixture should start bubbling a little bit. 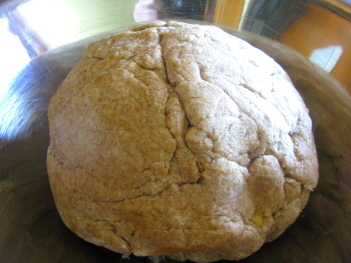 Dump in your dry ingredients (wheat flour, salt) into the yeast mixture. Turn on the mixer and let it knead the dough mix for about a minute until it forms into a ball. You can add a little flour if the dough is too wet, but not too much. Take your dough out of the mixer and divide it into two equal pieces. (You can store one of pieces in a sealed bag in the refrigerator if you don't plan to make both pizzas.) Place a little oil on dough and place in a bowl. Cover the dough with a kitchen towel and let it rise for about an hour. Punch the dough down. Then shape the dough into a circle and let it rest for about 30 minutes. Shape the dough by tossing it (if you're brave) or pulling the edges as you turn it, allowing it to stretch. Then roll it into a pizza shape or press into a pizza pan. Place the pizza sauce and toppings and bake on a pizza baking stone or pizza pan (center of oven) for 15-20 minutes or until crust is lightly browned. We'd love to hear your feedback on this whole wheat pizza dough!